Draft plans have been circulated for this is very important and heavily used route for walking and cycling at the south end of Gaol Ferry Bridge (plan). The current arrangement is most unsatisfactory and long overdue for improvement. This has come to top of the pile as Bristol Council tries to find deliverable schemes as the Cycling Ambition Fund completion deadline approaches in 2018. The CAF team have increasingly struggled to get through projects that demonstrate any real ambition for cycling with councillors failing to support plans for the Filwood Quietway Victoria Park, a missed opportunity or is something better than nothing?, and now we hear Easton Safer Streets – ask councillors to support is likely to have only token measures to remove rat-running through traffic. 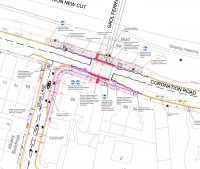 Schemes at problematic junctions like Coronation Road are welcome, but will be little more than sticking plasters that fail to achieve significant increases in cycling in the absence of a strategic vision and end-to-end routes that enable ‘Triple A Cycling’, for All Ages and Abilities. We were interested in the proposals from Bristol Walking Alliance for a more radical change to include the Dean Lane junction. We are pleased to see proposals for work on this is a very important and heavily used route for walking and cycling. The current arrangement is most unsatisfactory and long overdue for improvement. The key problem here is the bottleneck and congestion caused by the very limited capacity of Gaol Ferry Bridge. This can only be resolved by a new bridge and we hope to see the Southville (Camden Rd) Bridge proposal taken forward again, with necessary changes to the street arrangement of Southville to enable it to be the primary cycle route. Improvements to Bedminster Bridge must also make this a viable and pleasant route protected from traffic. That said the crossings at both ends of Gaol Ferry Bridge need attention and the proposals put forward have a number of positive ideas and represent a significant improvement for those currently cycling. Nevertheless they fall far short of what might be considered acceptable ‘Space for Cycling’, or indeed ‘space for walking’. They will do little to enable more people to feel safe and comfortable in starting to cycle. The footways on either side of the crossing need to be a generous as possible so the narrowing of the Coronation Road carriageway is welcomed. 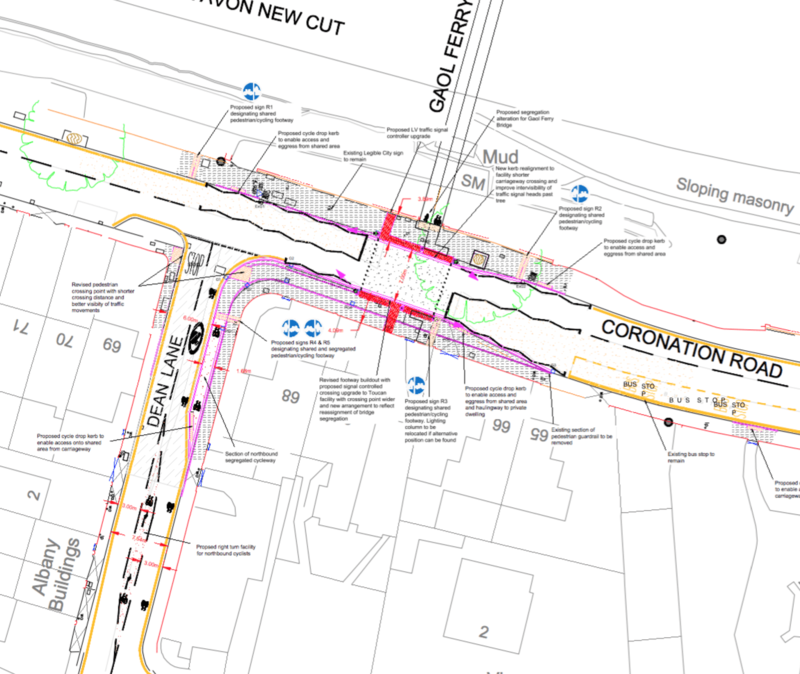 Bristol Cycling Campaign would prefer to see the whole section of Cumberland Road between Gaol Ferry Bridge and Wapping Road made safe and comfortable for Triple A (All Ages and Abilities) cycling on the carriageway. Clearly this is out of scope for the current works, but it must be included as part of the Wapping Wharf redevelopment. Given the aim of enabling and encouraging most cycle movements to and from GF Bridge to be along Cumberland Rd, leaving Gaol Ferry Steps as mainly pedestrian, the swapping of the walking and cycling sides on the bridge seems a good idea. Please can the new Toucan have an additional high level displays on the near side. There will often be large numbers of people waiting to cross and they will tend to obscure the standard height display. We are interested in the proposal from Bristol Walking Alliance for a crossing integrated with light controls for Dean Lane with phasing for walking, cycling and motor vehicles. We hope that time is taken to seriously consider options for innovation and ambition. This might also allow a ‘Green Scramble’ phasing to allow all pedestrian and cycle movements avoiding compressing walking and cycling at the formal (although wider) crossing. The right turn provision on Dean Lane for northbound cycles would be a great improvement. However the fact remains that cycles are being channelled onto what will still be a substandard and congested corner. Removing the curb and levelling the cycleway and footway may possibly help with more space for milling, but will not help with separation of the two modes. Delineation may help mitigate the inevitable difficulties. Can we really not find a better option? There is likely to be trouble on the east side crossing of Dean Lane as walkers wait to cross, while cycles are coming around the corner. Can we consider a continuous level pavement crossing on Dean Lane, but set back one car length. This would give better visibility for pedestrians wishing to cross Dean Lane and a better waiting point. Pedestrians often have to take this line anyway as there is often a vehicle waiting to get out onto Coronation Rd. This would also help to reinforce the 20mph on Dean Lane with some benefits for the horrid double bend by Holy Cross Primary. Can we take the opportunity to review positioning of street furniture with an aim to relocating or removal from the footway. In particular the legible city signs at both ends of the bridge are very uncomfortable and poorly positioned. The current responsiveness to crossing requests (button presses) must be maintained or improved. The drop curbs in advance of the crossing on Coronation Rd are appreciated.